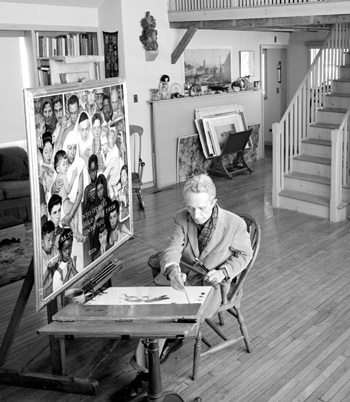 Bill Scovill, photo of Norman Rockwell in his Stockbridge studio, 1960. Norman Rockwell Museum Collection. ©Norman Rockwell Family Agency. Stockbridge, MA, March 13, 2017—Two of America’s most important visual communicators, Norman Rockwell (1894-1978) and Andy Warhol (1928-1987) embraced populism, created enduring icons, shaped national identity, and opened new ways of seeing during the twentieth century. This summer and fall, Norman Rockwell Museum will present the first exhibition to examine the artistic and cultural influence of these celebrated image-makers and the continued influence of their indelible legacies—Inventing America: Rockwell and Warhol is on view at Norman Rockwell Museum from June 10 through October 29, 2017. “Creative forces in American visual culture, Norman Rockwell and Andy Warhol looked out at the world from different vantage points to embrace innovation while satisfying, in unique and personal ways, the aspirations of a broad popular audience,” notes Norman Rockwell Museum’s Chief Curator Stephanie Plunkett, who organized the exhibition with the Museum’s Curator of Exhibitions Jesse Kowalski, formerly the Director of Exhibitions at The Andy Warhol Museum, where he worked for 18 years. Inventing America will present nearly 100 works that compare and contrast the two artists, including portraits of President John F. Kennedy and First Lady Jackie Kennedy, man’s first steps on the moon, and notable celebrities from the late twentieth century. The exhibition will feature original artworks from the collections of Norman Rockwell Museum, The Andy Warhol Museum, RISD Museum (Rhode Island School of Design), Williams College Museum of Art, and private collections. 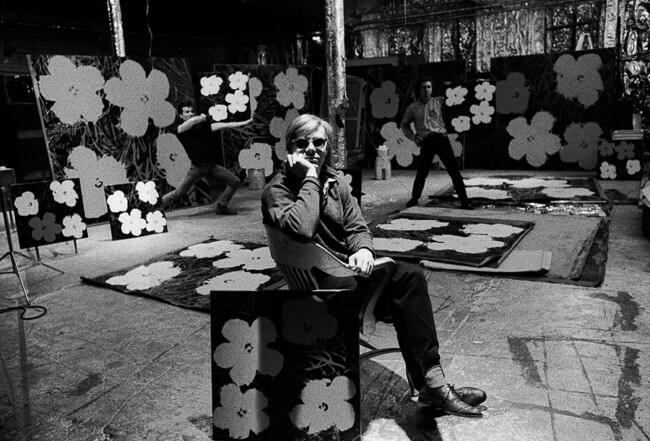 The exhibition will also feature archival materials and photographs relating to the artists’ lives and careers. Photo of Andy Warhol, Gerard Malanga, and Philip Fagan, New York, NY, 1964. Photo by Ugo Mulas. ©Ugo Mulas Heirs. All rights reserved. As innovators, Rockwell and Warhol each created and adapted techniques to advance their art to new ends. Their curiosity and invention, reflected in their work, resulted in the collapse of clear boundaries between high and low culture. Inventing America will include objects utilized in their artistic and technical processes, such as their projection devices, and other personal effects that reflect their unique sensibilities. The exhibition will explore such themes as the elevation of the ordinary; notions of an idyllic past; the culture of celebrity; and mass media and the power of visual communication. Inventing America: Rockwell and Warhol is generously sponsored by The Hayseed Hill Foundation, Inc. and The Red Lion Inn. Explore the illustration art of James Warhola, nephew of pop artist Andy Warhol. Born in Pittsburgh, Pennsylvania, Warhola was greatly influenced by his uncle. Warhola’s interest in science fiction, fantasy and comics landed him in the middle of the publishing world, where he went on to illustrate over 300 book covers for the most popular writers of the day. In 1980, the editors at Mad Magazinecommissioned him to illustrate their paperback covers, leading him to become a regular contributor. He was also selected as one of the primary artists for the very popular Garbage Pail Kids card series. This exhibition, on view in conjunction with Inventing America, will explore Warhola’s body of work across artistic genres. Original art from his award-winning children’s books, Uncle Andy’s and Uncle Andy’s Cats, will be featured. Saturday, June 10, 6 p.m. Celebrate the opening of Inventing America: Rockwell and Warhol and James Warhola: Uncle Andy’s and Other Stories during a special gala and Studio 54-style after-party. The evening will feature a festive cocktail reception, tour of the exhibitions, and an al fresco dinner on the Museum’s terrace. The event will pay tribute to the creativity of the artists’ family tree with special honorary co-chairs Geoffrey Rockwell, grandson of Norman Rockwell and Director of the Kule Institute for Advanced Study Arts at University of Alberta; and illustrator James Warhola, nephew of Andy Warhol. The Legends Gala is generously sponsored by TD Bank and Sotheby’s. The after-hours dance party is being presented as part of a Berkshire “Dance For All” summer, in collaboration with IS183 Art School, Only In My Dreams Events and Berkshire Theatre Group.